This episode picks up where the previous week’s foreshadowed it would: “Baylis” is in the radiation chamber. Luna’s blood transfer worked and he’s producing his own nightblood, woot, woot! The bad news? Well, when Jackson cranks up the radiation, “Baylis” becomes gross barbecue. The group insist that they have to try again, but the only option to try anything on seems to be Emori. Luna says that hunting for people to kill is not the answer and points out Baylis’s bracelet that represented his ancestors. This confuses Clarke and crew considering Baylis was supposed to be Sangedakru. As it turns out, Emori lied to everyone — which we already knew — hence, the group imprisons both Murphy and Emori and debates whether or not they will become the next test subjects. Luna finally puts her foot down and refuses to donate anymore marrow. The really messed up part? The group strap her down to extract her bone marrow without her permission. This causes Raven to state the obvious: “Welcome to Mount Weather.” Roan convinces Clarke this is the right thing to do in order to save ALL of humanity. Miller then drugs Emori and carries her to the radiation chamber while Murphy screams at the top of his lungs, pleading for her life. Abby can’t bring herself to inject Emori with the nightblood, so Clarke takes the needle and stabs herself! Abby completely loses it and destroys the radiation chamber in a pile of tears. “I can’t lose you.” I am not happy. Like, okay, yeah, I didn’t want Clarke getting tested either. But now what are you going to do you idiot? You’re going to watch her die to radiation in a couple of weeks anyway. Back in Arkadia, Skairkru is having a ceremony for the people they lost to the acid rain. Jasper decides it is time to celebrate life more and wants to take a trip to the woods to get the hallucinogenic berries from the first season. Bellamy is not having it, but decides to follow Jasper anyway to make sure he is safe. I am not okay with this. When Jasper and Bellamy eventually come back, Bellamy has become “lead life to the fullest” Bellamy. I am not pleased. Meanwhile, Jaha has found a new mission. Apparently the Flame Keepers have a saying: “From the earth we will grow, from the ashes we will rise.” He realizes it’s the saying from the creepy cult and that they didn’t find the right bunker. Jaha convinces Kane to take him to Indra, who will hopefully lead them to Gaia. Monty goes along with them to Polis, where Trikru and Azgeda are in the middle of all-out war. Indra is upset to see them, but begrudgingly helps. 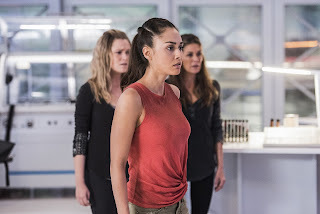 She leads them to Gaia, who has a tattoo that matches Jaha’s medallion. It turns out that the symbol is on Becca’s crypt, which is currently guarded by Azgeda. The group battles their way to the temple because Indra can’t keep her temper in check and find the crypt. The group eventually figures out that by putting the medallion in fire, it becomes a key to the crypt. As the group descends, we get to wait for answers! Anyone think that Raven is looking a bit Becca-ish? And is everyone else concerned that Abby’s brain looks like it is frying too? It seems to be a bit ignored. Clarke’s nightblood is going to come into play, but I’m not okay with her being the new commander. She’s already taken a chip once. Can we please reunite Bellamy and Clarke? Bellamy is doing dumb stuff without her there. Luna and Roan are my favorites and you all can fight me on it.